Sorry... the 2016 BMW 228 is no longer being sold as new. After adding a new convertible body style last year, the 2016 BMW 228 gets a small update for the new model year adding some standard equipment including an alarm system, an updated instrument cluster, auto dimming rear and side mirrors, and a universal garage door opener. The 228, along with the M235, are the two members of BMW’s 2-Series which replaced the outgoing 1-Series. The 2-Series is slightly longer (2.8 inches) than the 1, which helps it to look sleeker and less stubby. 17-inch wheels and halogen headlights come standard. Moving under the hood, the 228 shares its engine with the 328, 428, and 528 among others in the BMW stable. The 240-hp, twin-turbocharged 2.0-liter four-cylinder engine comes mated to an eight-speed automatic or a six-speed manual transmission, which is offered as a no-cost option. Though it’s been around for several years now, this engine remains a favorite of ours; it seems to offer more power and performance than its specs would indicate, and tucked into an even smaller package than the larger cars it’s also in will only serve to enhance its characteristics even further. Rear-wheel drive is standard, while 228i xDrive models offer all-wheel drive. The engine has also been outfitted with a start/stop system, which enhances fuel economy (23/36 mpg city/highway for RWD models). Inside, the 228’s added length gives it more legroom for rear passengers and a little bit more cargo space (13.8 cubic feet). 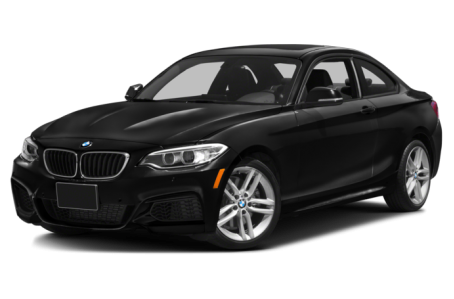 Standard features include dual-zone automatic climate control, push-button start, Bluetooth connectivity, and a 6.5-inch display that is powered by BMW’s iDrive infotainment system. Leather upholstery is optional, as are a navigation system and a premium Harmon Kardon audio system. In the standard safety department, the 2016 228 checks all of the required government boxes: antilock brakes, electronic stability control, and eight airbags all come standard. The 228 is also offered with some of the latest safety technology as well, such as adaptive cruise control, park assist, a rearview camera, and BMW’s ConnectedDrive. 4 of 5 (80%) consumers said they would recommend this vehicle to a friend.